Watts Flowmatic 10" Full Flow Water Filter Housings are ideal substitutes for costly low pressure stainless steel vessels. 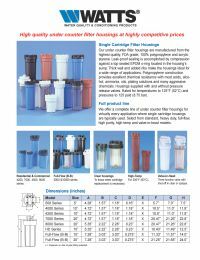 Full Flow filter housings offer the versatility to meet all of your large-capacity filtration needs, including high-flow and heavy-sediment applications. The extra large housing allows for greater cartridge capacity, reducing the number of vessels required for high-flow rate applications. Full Flow Housings are compatible with a broad range of chemicals. Reinforced polypropylene housings have excellent chemical resistance and are ideal for many residential, commercial and industrial applications.